College life can be stressful. It’s even more stressful when you’re failing your classes. So what do you do in college to relieve stress? You party, drink, and pretty much everything else that has nothing to do with your school work. Unfortunately, these activities usually do more harm than good to your grades and sanity. If you ask for advice about how to improve your college grades, most people will tell you to use a better studying strategy. However, let’s be honest, sometimes just studying isn’t enough. 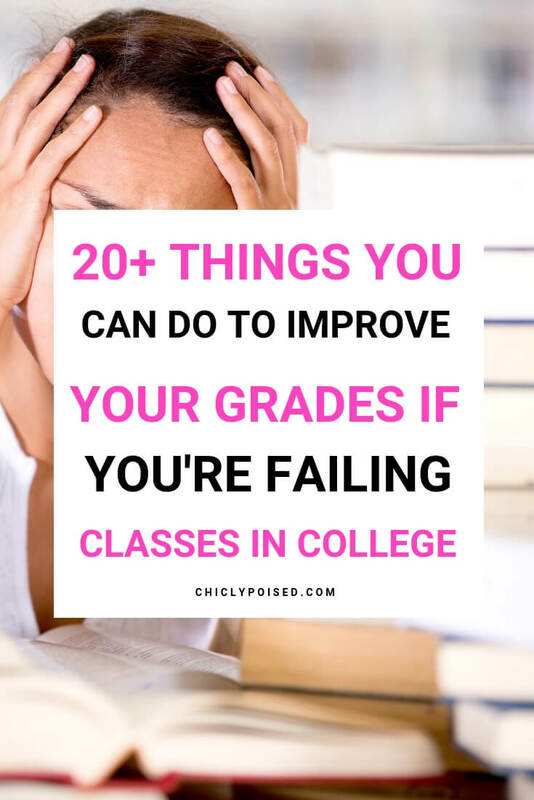 Now, this isn’t to say that improving your grades is impossible – it is still possible you just have to change your college routine a little bit. Get your grades up by incorporating these tips into your college routine. Good luck! This is a lot easier than what it may seem. If you have multiple classes then the chance of you seeing the same students in most of your classes is pretty high. In these situations, it is easy to form a study group with those students. When it’s all said and done you passing or failing a class also depends on the professor. If you don’t know already professors do not have much pity for college students who don’t show up to class so try to attend your college classes regularly. Most professors dislike when students are late for classes. Some hate it so much that they will lock the door, forcing you to miss class if you’re late. Moreover, also understand you run the risk of missing vital notes and information when you’re late to class. It is a lot easier to stay focus by sitting in the front of the class versus sitting at the back of the class. Sitting in the front also help you avoid distractions. In fact, when you are at the front it is a lot easier to keep yourself accountable because now it becomes a lot easier for the professor to see you doing things you really have no business doing, like sleeping or playing on your phone. When you’re engaging in class it is easier to retain the information that you’re learning. Plus it gives the impression that you’re trying to pass the class which can help you in the long run when the professor is grading your work. Breaking news! A lot of these professors do not enjoy putting extra effort into grading paper or creating new assignments/exams. So many professors reuse old assignments and exams from previous years and even from previous assignments/exams given earlier on during the semester. You can get a hold of past exams by using Google or by talking to someone who already took the class. When you show that you’re really trying to pass the class professors take notice of that. Some professors will go as far as bumping your grade a whole letter if they really want you to pass. This will not be the case if they don’t see you putting in the effort because their thought process is “If they don’t care about their grade then why should I?” Attending office hours will show your professor you’re serious about graduating. It will also give you an opportunity to ask questions that you forgot to ask in class or questions you don’t feel comfortable asking in class. Come to class with the mind frame of not getting distracted because the last thing you want to do is miss out on important information. Keep in mind that some professors give out information you can only get if you attended class. In a worst case scenario, you can always get the notes from other students who were paying attention, but it is always the better to not rely on others if you can help it. Be prepared to party less and spend less time with friends. If it is not a school-related activity then you will have to focus less on those things and put the majority of your focus on passing your classes. Partying and drinking are cool from time to time. This can take the edge off during stressful times, but partying every night and being too hungover to do anything in the morning take away a lot of your time. If you’re looking for a stress reliever then try working out or maybe enjoying one of your hobbies during your study break. Professors want their students to pass and are more than willing to help out. Students are more than willing to team up with other students to pass their class. Utilizing these two things can help you out tremendously if you’re likable. If you are unlikeable professors will care less if you pass or fail and students will be less willing to study with you or help you out. Don’t be scared to ask your professor what will be on the exam and what the topics you need to study more. Once you have this information highlight these topics in your notes and textbooks and put your focus on those topics while studying. This is something you really need to do before the semester starts but it’s not too late. The reason why used textbooks are good to use because the important details you need to study most times are already highlighted by the previous owner. The syllabus will give you an idea of what to expect from the professor and what to study for throughout the semester. Here is a hack for all college students. If you’re taking an exam or quiz online especially for online classes copy and paste the question in Google search to see if the answers are available online. Websites like Quizlet are notorious for helping students pass exams. Now of course, in the long run, you would be better off trying to fully understand the concepts being tested then take the exam but Google helps too. This is very helpful if you are taking online college courses. If you realize a certain class or professor isn’t for you then drop out. Sometimes you deal with professors that make the class difficult for no reason and passing that course is a matter of taking the class with a different professor. I highly recommend moving forward you use Rate My Professor before you enroll in classes. If you’re reading this and it is too late to drop your class then no worries. These tips provided here will help you get back on the right track if you are willing to work hard. In times like this, you will need all the positive energy you can get. People who will doubt you and encourage you to do everything but your schoolwork isn’t anyone you need to be associated with. Hence, do your grades and yourself a favor by cutting them off. If a professor gives you the opportunity to do extra credit then take advantage of that opportunity. If they don’t mention it in class or in their syllabus then visit their office and ask them if you can do anything for extra credit. Whether or not the professor gives you extra credit depends on the professor themselves and the amount of effort you put in class throughout the semester. If you barely come to class but the times you do come to class you’re always late plus you don’t pay attention instead you distract others then the chances of the professor giving you extra credit is slim to none. It is understandable that there will be sleepless night due to studying, but if you can help it try to get as much sleep as you can. It is a lot easier to focus in class and study in general when you had a good night rest. Studying consist of learning the information and retaining that information. That is easier said than done. You can only cram so much information at once and the chances of you retaining that information are not too great. Give yourself time to really study the material and you will pass your exam. Some professors will provide a practice exam which can be a great resource to use to prepare for your exam. If you’re not given a practice exam then make your own. Put questions on index cards with the answer on the back and try to answer the question without looking at the answer. Tutorial sessions are there for a reason and failing a class is the top reason you need to abuse these sessions. If you are failing a class you need to be a regular attendee at these sessions. Sometimes a one on one with another student can make a big difference in understanding a difficult concept. Moreover, you can ask the tutor all the questions you were probably too afraid to ask during class or even during office hours. As stressful as being in college can be it will all work out in the end if you give it everything you got. A lot of times when you’re taking a difficult exam sometimes most of the other students are struggling too so you’re not alone in this. Not to mention that if everybody fails it is not going to be the best look in the world for the professor. Hence, the reason a lot of professors give curves to help everybody pass. So take heart and know there is light at the end of the tunnel just change your college routine a bit and be willing to work hard or harder to improve your grades.